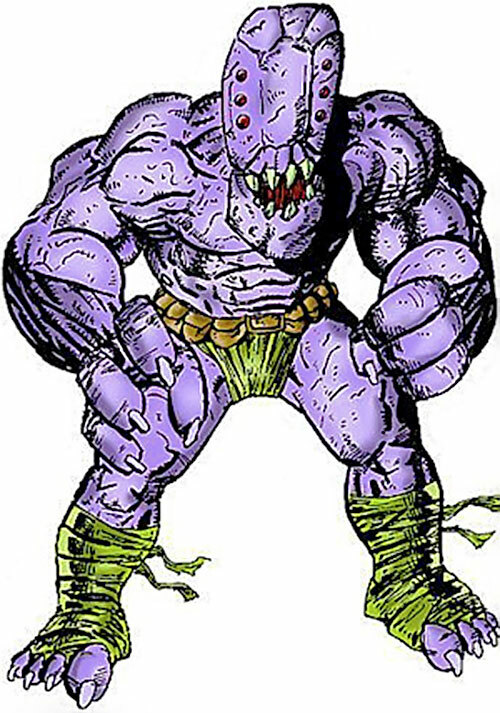 The oddly-named Rudehead is a monstrous, aggressive mutant. 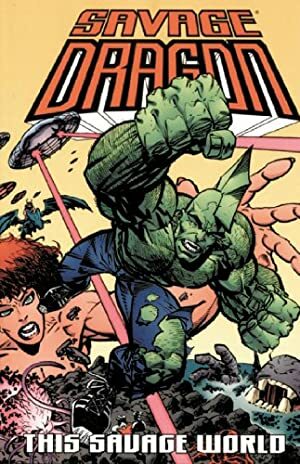 He was seen in several Savage Dragon stories, starting in 2000. Base Of Operations: Danger Zone west of Chicago. RudeHead has incredible strength, the extent of which has yet to be fully gauged. He is also exceptionally tough and resistant to most types of attacks, and moves fast and viciously. The Danger Zone is a vast, and extremely dangerous, area due West of Chicago. A remnant from the time Sebastian Khan ruled the Earth, the Danger Zone is a lawless land. It has become a refuge to mutants, freaks, and outcasts. The zone actually is very similar to a typical post-Apocalyptic landscape from DC Comics’ Kamandi series. The United States government has hired Dragon to help clean up the area. Progress has been slow due to the high concentration of freaks that live there. RudeHead is one of those freaks as a member of the gang named the Sky-Riders. When Dragon first arrived in the Savage New World, he was attacked by numerous threats. All of these were a complete mystery to him. A gang of super powered beings lured the Dragon into their home where their strongest member, RudeHead, savagely attacked the hero. But he was defeated in battle. While RudeHead was unconscious, many of his fellow gang members were consumed by a giant spider. RudeHead also had a run-in with either Mighty Man III (Chelsea Nirvana) or Mighty Man V (Billy Berman) as he was causing all kinds of troubles in the Danger Zone. Defeated, he was brought to Chicago where the police were threateningly told to lock him in. Since the police department lacked evidence of any criminal activities connected to RudeHead they probably had to let him go, at the very latest as soon as the evil Mighty Man lost his powers. It is assumed that RudeHead returned to the Danger Zone to continue his preying gang activities. 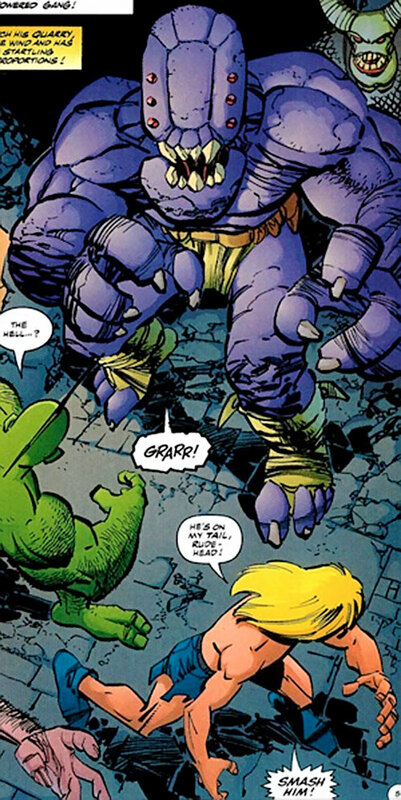 RudeHead is a huge, muscular monster-like man. He has purple skin and four fingers and toes. His oblong head has a diamond-shaped forehead, a huge gaping mouth with large teeth and a total of six red, circular eyes set in two vertical lines of three eyes on each side of his head. Both his hands and feet have narrow, but long nails. RudeHead is naked except for a pair of green shorts, an odd belt with brown pellets and the lower legs wrapped in green bands. RudeHead is a dangerous bully. He is a good team player and plays the role of the big, bad man of the Sky-Riders. He seems to protect his gang and their interests by attacking any non-member. In fact, the gang’s main activities seem to be physical combat against the weaker, possibly with the motive to rob them. He seems to use full, lethal force on all occasions. RudeHead does not seem to be able to talk. Area Knowledge (The Danger Zone west of Chicago), Lightning Reflexes. MPR (Mute), Strange Appearance (Huge humanoid monster with six eyes).